We do a variety of movie making, from shorts to explain a concept all the way to things you may some day see on the big screen. Most of the serious movies we are involved in can be caught at the Film Festivals in your area. There is enough movie making folks around the halls that the language of movie making is often spoken. Folks throw out a quick comment like “today we are doing a loose framing shot for the flashback, make sure your eye-level angle is correct”. We all think, “show off”. Actually, all of it makes perfect sense, especially when you have the Free (normally $2.99) Universal app Close Up Film Language Glossary loaded on your iPad. 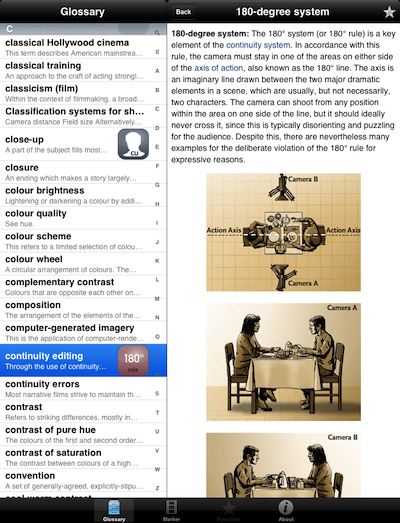 With it handy at finger tip distance, we can look up a word or phrase, get a short or long description and many times there is also descriptive diagrams to reference. 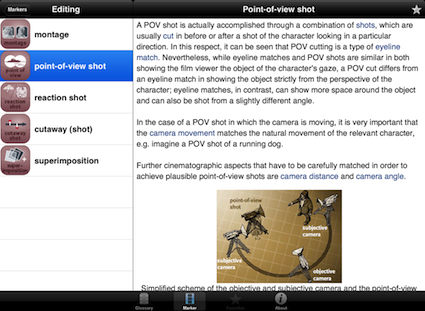 Along with the Glossary of terms, ‘Close Up‘ also has a ‘Markers’ area for finding Shot and Cut/Editing terms. It will be interesting to see how many iPad/iPhones come out quickly after one of the movie folks says a filming phrase in the future.